HowStuffWorks.com has a great article on how to make a terrarium. The image in the article is more of a Wardian case but there is some helpful information in the article. There is a good reference to some tools you can make to create and maintain your terrarium. * Use a fork taped to a chopstick or an artist’s paintbrush to make planting holes for terrarium plants. * Set plants in place with another chopstick fitted with a small wire hook or loop. In containers with wide openings, you can use tweezers or tongs. * Tap down the soil around plant roots with a cork or spool attached to a stick. When you’re done, lightly spray the plants and soil surface with water. 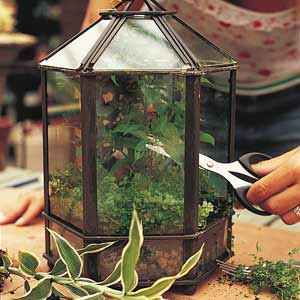 HowStuffWorks.com "How to Grow a Terrarium"
I like that terrarium it's nice. I featured that article too and agree it is very good though you are adding to our knowledge as well.